Welcome Webelos 2s to Troop 132! This is an exciting time of the year for you. You have made it to 5th grade and your second year as a Webelos. You have been hard at work while enjoying some scouting fun. Now is the time you have been waiting for! It's Boy Scout time. It is important that you find a Troop that fits you personally. 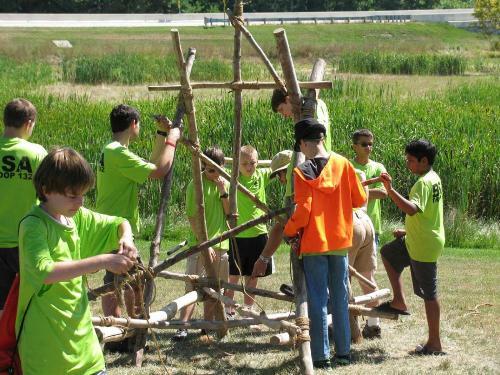 Carmel has many fine Boy Scout Troops and we encourage you to explore several Troops in the area. We offer meetings specifically designed for Webelos 2s to get to know our Troop, to get an idea what our meetings are like, to learn some Scouting skills, and to have a lot of fun! Come to these special meetings at St. Christopher's Episcopal Church, 1402 W Main Street, Carmel, IN 46032.
with games, obstacle course, Haunted House, tent camping, and troop camp-cooked dinner and breakfast. But if these dates don't work for you, we welcome you at any time to our meetings held every Monday night from 7:00 to 8:30 PM at St. Christopher's Episcopal Church. If you have any questions, you can email our Recruiting Chair, Teresa Zimmers-Koniaris. For new parents, we are using a Google Docs form to gather your info. We'd like to get to know you a little better and see how your skills may be used in the troop.